There was a lot of hype leading to the release of Sea of Thieves. Since the Xbox One doesn’t have a lot of exclusives anymore (and the ones it does have it shares with the PC), Microsoft is putting a lot of PR effort into the ones they do have. And it worked. Many of us here at GamersPack were really excited to play the game, myself included. One of the reasons for that was its developers – Rare. 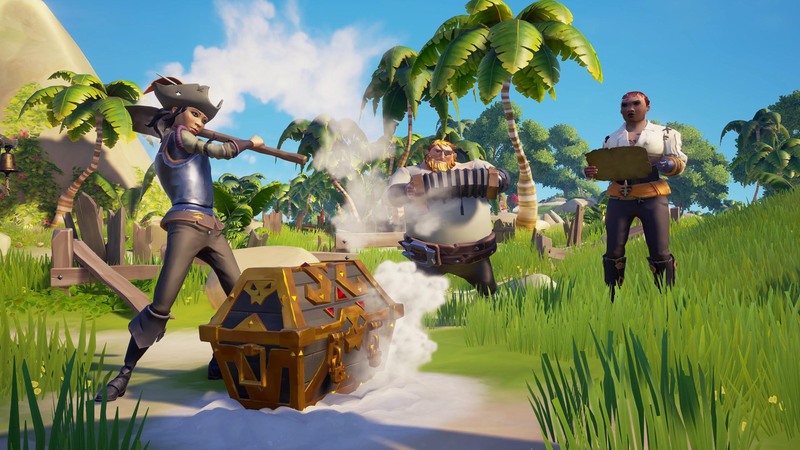 Rare made a lot of promises during SoT’s development process: stunning graphics, a rich world with endless adventures, and a co-op experience that will make you feel like you’re a part of a real pirate crew. Does the game deliver on all these promises? Technically yes. Does it do it uses these mechanics to provide a deep, fun and meaningful gameplay experience? Not really, no. I could end this review right now. I’ll include a link to some random Sea of Thieves Beta Impressions article, and you will know everything there is to know about the game. Except for some connection problems and minor issues with the progression system, the game’s mechanics were polished to mere perfection by the time the final open beta rolled around. But the game lacked a plot or anything to put some meaning behind its gameplay. When playing the beta, I was wondering if that’s all the game has to offer: three types of missions and one Raid event? Is that all? I was hoping the final version would have more to offer; that Rare had a joker up their sleeve. To my disappointment, Rare’s sleeve is empty. All of Sea of Thieves boils down to three types of voyages, the game’s term for missions, given my three different factions. The Gold Hoarders send you after treasure chests, which involve some digging and maybe a puzzle or two. The Merchant Alliance sends you on various fetch quests to deliver pigs/snakes/chickens to different islands. The Order of Souls will send you on a literal headhunting quest and will ask you to bring them the skulls of legendary skeleton pirate. Once in a while, you’ll come across a message in a bottle that will send you on a new treasure hunt. Completing these random missions earns you both gold and reputation with the factions. You can spend your hard-earned gold on consumables and cosmetic items, while a higher reputation allows you to set sail on more dangerous and profitable voyages. Apart from the three different kinds of fetch quests, the game throws at you an occasional raid. 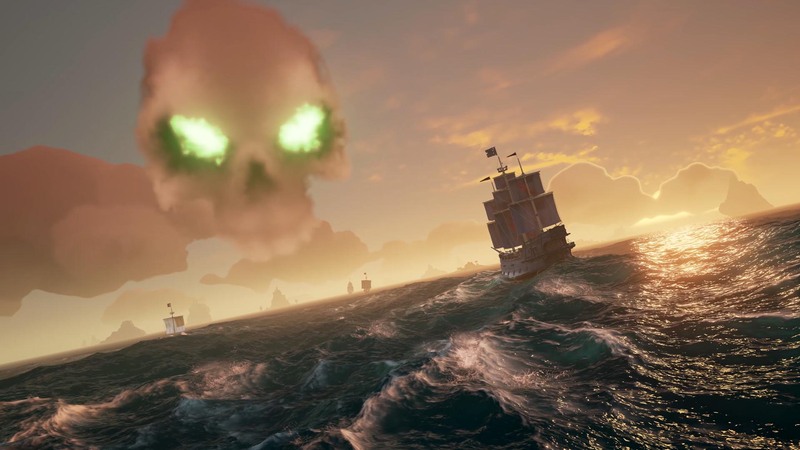 Skull-shaped clouds appear above skeleton forts on the horizon, signaling the crews on the current server that a raid is active. Completing it with or against other teams will boost your reputation with all three factions and fatten your wallet. Another world event is the Kraken encounter. The Kraken is a mythical marine beast with multiple tentacles that will emerge from the depths of the sea and attack your ship without much warning. Well… I wouldn’t say “emerge” per se, as the monster is just a set of tentacles. If you dive down into the water, you won’t find a grotesque creature waiting to devour you – just a lot of nothing. The Kraken’s job is to make your life miserable. The only way to beat it is by shooting the tentacles (preferably at the gaping mouth at the end of it), and sailing away as soon as you can. The most irritating part? You won’t get anything out of this encounter other than an achievement. And that’s about it; that is all the PvE that game has to offer. 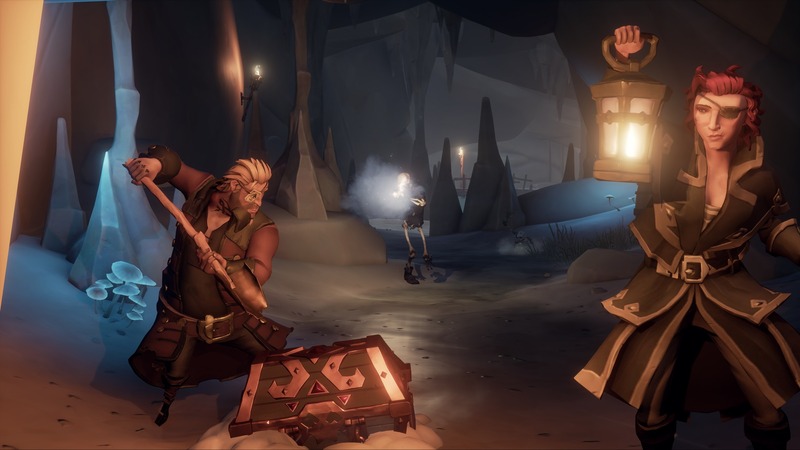 Rare did announce that it will be adding more free content as SoT moves forward, but the game is being sold as a full AAA game (with a price to match), and not an Early Access title. There is endgame content if you can even call it that. Once you have maxed out your reputation with all factions and completed a set of tasks, you will start the game from a “secret spot,” from which you can venture on more difficult voyages. But again – they are more of the same. Don’t get me wrong – what’s already in the game runs like clockwork. When the sails catch the wind, the music swells, and your controller rumbles as waves hit the bow of your ship – you feel just like a pirate on the high seas, on the hunt for treasure and adventure. The only thing missing is the wind blowing through your hair and the salty smell of the sea. Although the game mechanics work well together, they lack depth. The three different firearms all feel the same, and there are only two types of ships to choose from. Even the enemies you encounter don’t offer much of a challenge for a team of four pirates. That is where the Sea of Thieves PvP component comes in. After a while, your crew will be fed up with the PvE voyages, and will probably decide to harass and plunder other players. And you really should, as PvP is where the game lets you experiment will the tools it gives you. If you and your crew enjoy messing around and don’t really care about actually surviving a fight, you’ll have loads of opportunities to get into all sorts of bizarre, often hilarious situations. But even if the PvP is funny at times, it isn’t free of problems. The main one is the respawn times – they are too short. Dead players come back into the fight in a manner of seconds, and even if you destroy a rival crew’s ship, a new one will eventually respawn. Every small skirmish between teams can quickly turn into an endless PvP loop until one side just gives up. Raids act as a beacon to all nearby crews, so there is where you’re likely to come across other teams. Then you have to decide what to do – do you fight each other over the treasure in the fort, or team-up and split the riches? The problem is there’s no way to communicate with the other crew. Voice chat is contextual, so a player that’s not in your party will only hear you if you’re standing close enough (and by that time it’s too late). There’s just no way to signal your intentions. No flags, no carrier pigeons, no smoke signals – nothing. 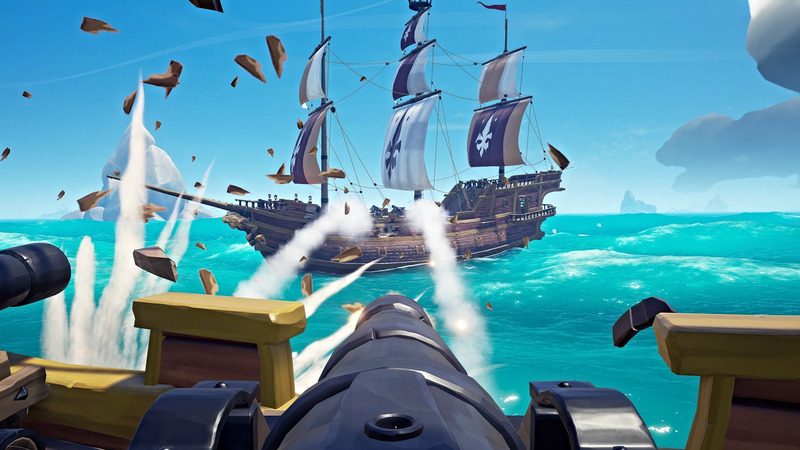 Despite the lack of content and the overblown price, there are plenty of people playing SoT at the moment, so you won’t have any problems finding mighty pirates to roam around with. It could be all the hype the game generated, but I’m sure the cross-platform play between Xbox and PC helps bring more players together. It works relatively well, with just a few minor hiccups. And this game was made for co-op. Where it’s setting sail for booty, sitting at the pub drinking, or showing off your new pegleg, it’s always more fun with your friend around. Only time will tell if the winds of change guide Sea of Thieves to a safe harbor. In the game’s current state, I couldn’t play for more than a couple of hours at a time, before losing interest in the repetitive missions and the PvP. But maybe that’s not what the game is about. Maybe it’s not about braving storms and hordes of skeletons to secure a single treasure chest. Perhaps it’s about it’s just about enjoying the pirate’s life, without a care in the world.